Excited about Rob's new movie coming out on Friday? Cineplex.com has an 11 minute video on the making of Revolution. The kids on Saipan make an appearance at the end, too! 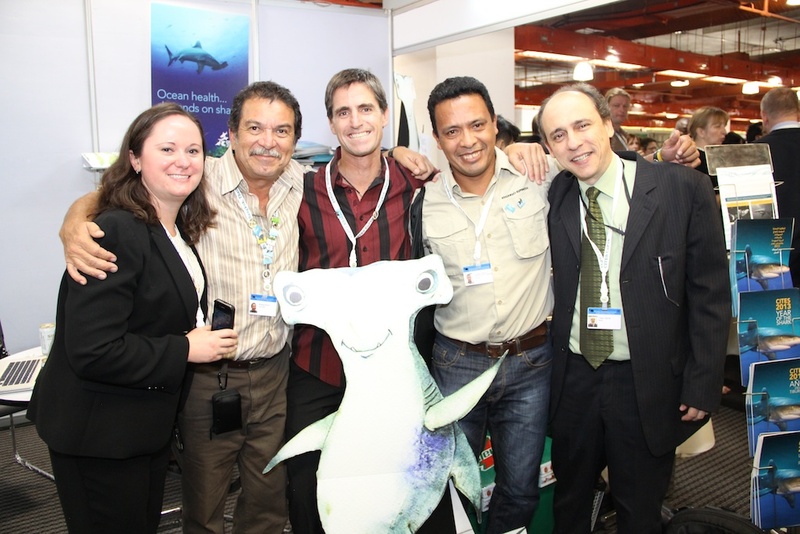 Elizabeth Wilson of the Pew Charitable Trusts, Randall Arauz of PRETOMA, Shawn Heinrichs of WildAid, Eduardo Espinosa of Ecuador, and Dr. Fabio Hazin of Brazil with Shark Stanley at CITES. 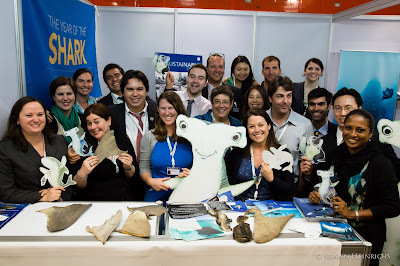 With the listing of hammerhead sharks in Appendix II of the Convention on International Trade in Endangered Species of Wild Fauna and Flora (CITES) during the sixteenth Conference of the Parties (CoP16) held from March 4th -14th in Bangkok, Thailand, the world expressed the urgent need to protect this species from the threat posed by the international trade of its products, particularly fins, which are highly prized to prepare shark fin soup in Asia. 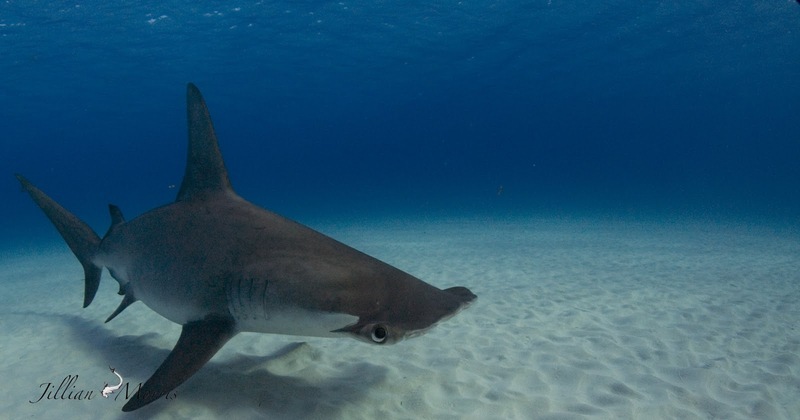 The latest scientific information available indicates that up to 100 million sharks are killed each year to meet the demand of the international market, which has led to a 90-95% demise of global hammerhead shark populations. The need for action is compelling. Costa Rica, along with Honduras and Brazil, proposed the inclusion of hammerhead sharks in Appendix II of CITES, hoping to finally interrupt this unsustainable extraction of sharks, which has been denounced for decades but for which no effective measures have been taken in a regional, or even less, a global context. 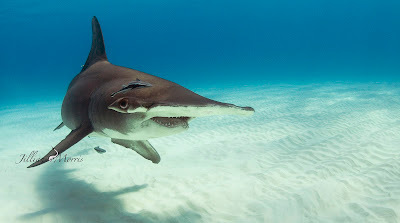 It must be pointed out that the listing of hammerhead sharks in Appendix II does not mean that a total ban on the international trade of the species will be installed, but rather guarantees through the issuing of a “Non Detriment Finding” by the exporting country that the extraction of specimens from the wild population was done in a sustainable manner. Failure to do so translates into economic sanctions. This of course, directly interferes with the current unsustainable extraction of sharks, something that the Asian block of nations, led by Japan and China, weren’t about to allow. 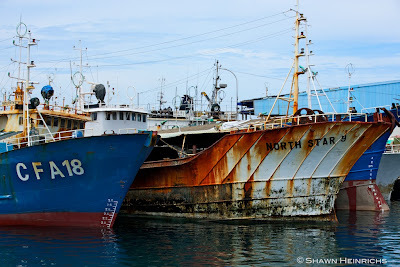 Lacking any technical arguments, they claimed before the delegates of the world that this measure would not only be too difficult to implement, but it would also have adverse effects on artisanal fisheries in developing countries. Nothing could be farther from the truth! Is Cites meant to work only when implementations measures are easy? In addition, artisanal fishers are not affected by Cites any way whatsoever, as they trade mainly juvenile sharks in domestic markets. In any case, if anything at all they benefitted by the measure, as it guarantees the sustainable exploitation of adults in the high seas. 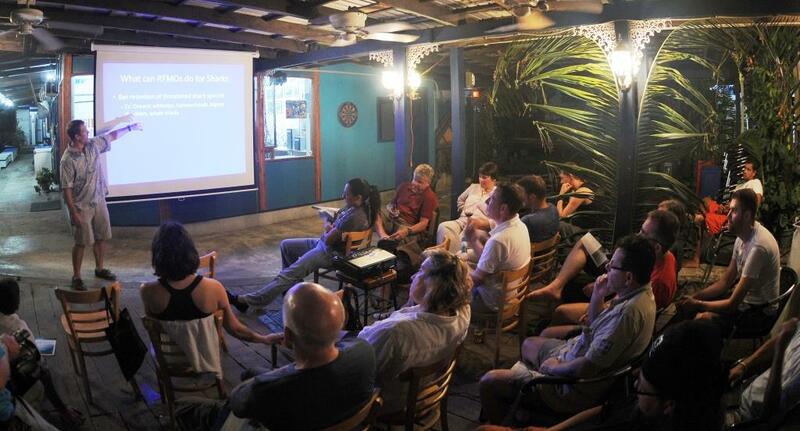 The recent 2013 Palau Shark Week attracted over 70 divers from all over the world to take part in Fish ‘n Fins’ fascinating week of encounters. 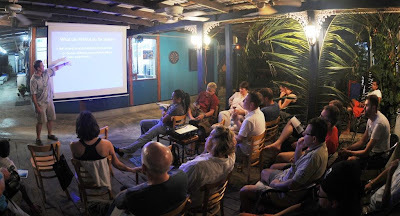 Great shark dives in both new and classic dive sites were the highlights of the week as well as captivating evening presentations, which showcased a diversity of shark experts, including Dr. Mark Meekan of AIMS on the Micronesian Shark Foundation research update, Tova Harel Bornovski of the Micronesian Shark Foundation on Shark school education in Micronesia, Adam Baske of the Pew Charitable Trusts on Illegal fishing, Kate McKay of Melbourne Aquarium, and Michael Janssen of PADI on Project AWARE and shark conservation efforts. 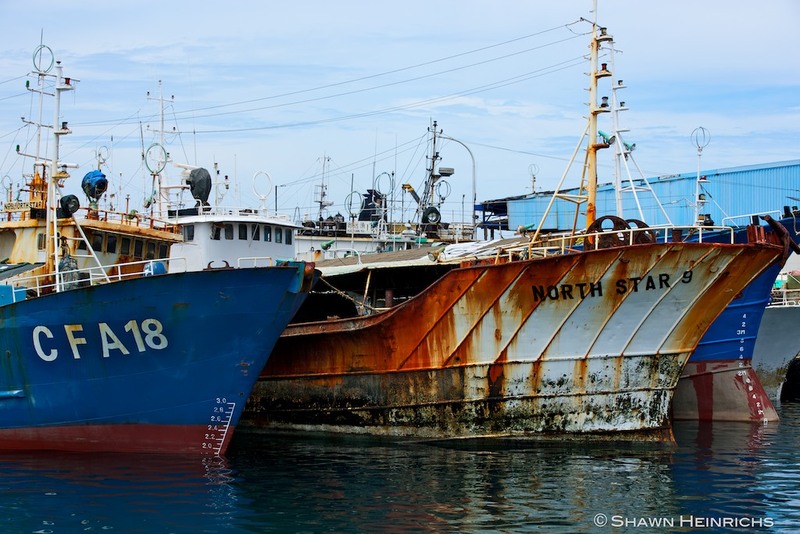 The Micronesian Shark Foundation debuted a documentary of a scientific Expedition to South West Islands of Palau and the grim effects of illegal fishing on these reefs. The Shark Week Gala night with Palauan delicacies and many distinguished guests made a perfect ending to this Extravagant Shark Week. 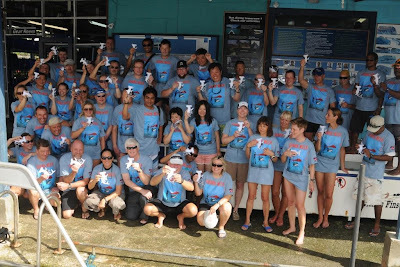 For those interested in joining Shark Week 2014, please send an e-mail to: info@fishnfins.com. 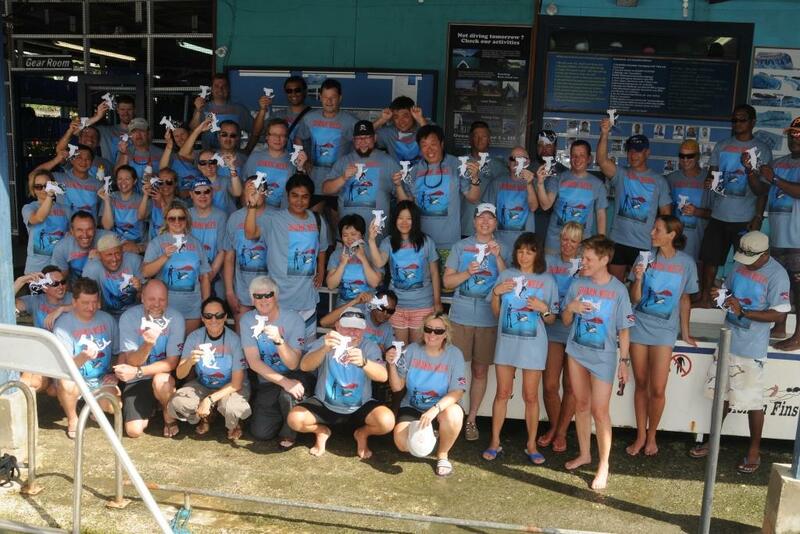 Fish ‘n Fins will be hosting “WREXPEDITION,” which is dedicated to Palau’s WWII Wrecks from June 4-11, 2013. For more information, please visit www.fishnfins.com. Last week the Huffington Post published an infographic: How Many Sharks Are Killed Per Hour? The visual is based on Boris Worm et al's new paper estimating between 63 and 273 million sharks are killed each year. Contrast that graphic with this graphic from the National Post: A Hundred Years of Shark Attacks. A letter to the editor in the South China Morning Post by Charlie Lim, Conservation and Management Committee Chairman of the Marine Products Association, contains some excellent shark fin industry spin. These are some of the first post-CITES messages coming from industry and they portend what we can expect in the coming years. The victory at this year’s Convention on the International Trade in Endangered Species of Wild Fauna and Flora was the result of years of hard work. After losing all of the shark proposals in 2010, pro-conservation countries and NGOs reassessed and readapted their strategies to address the arguments against listing sharks on Appendix II. Now that they’ve lost, it is industry’s turn. The science behind the shark listings was undeniable and the opponents did not even bother to question it. They questioned the implementation. Proponents worked tirelessly to prove the listings could work. For example, the Pew Charitable Trusts developed an easy to use shark fin identification guide and the European Union pledged 1.3 million Euros to support implementation. The successful listings were a blow to industry, which has benefited from the unregulated nature of the shark fin trade for many years. Starting in 18 months when the CITES listings go into effect, the unsustainable and illegal trade of shark fins of these species will end. Exporting countries will have to issue non-detriment findings and permits for trade to continue. Expect industry to make implementation as difficult as possible. Kneeling on the white sand bottom I gaze into the blue haze, watching, and waiting. A nurse shark completely decorated with remoras cruises in. He nonchalantly checks out the area before inhaling a small piece of bait. Don’t get me wrong, I love nurse sharks even when most people turn their noses up at them, but today they are not our target species. We are waiting for something greater, the most magnificent creature in the ocean, rare, and elusive. I strain to make out a shadow in the distance. The distinct fin comes into view and soon a great hammerhead is gliding past. This is what we are here for. March was certainly the month for great hammerheads sharks, especially here on the tiny little island of South Bimini in The Bahamas. January through March each year finds these incredible animals passing in close proximity to the coast and for nearly a decade the Bimini Biological Field Station (Sharklab) has been developing sites to observe, dive with, and tag this endangered species. Until this year, this aggregation had managed, for the most part, to stay off the radar. This created an ideal research and diving venue, uninfluenced by outside factors. Word spreads quickly though and divers around the globe have traveled and are making plans to travel to see this underwater shark Eden. The crystal clear water and the shallow depth make this an ideal place for photo and video; It is probably the biggest draw for the masses now flocking to Bimini. The sharks cruise in and circle around the bait. These charismatic predators are bold, but not aggressive. They have comical faces, with their mouth on the underside and large cartoon eyes precisely placed at the ends of their odd heads. They appear to be laughing at a joke or smiling for the camera. They exude power and grace, with a Cheshire cat smile. In my opinion, there is nothing more beautiful to witness underwater than a solitary great hammerhead. Beautiful, but almost alien compared to the torpedo sleek body shape of a shark. Sadly, the elusive nature of these creatures, which has launched a global interest in photographing and filming them, is also the reason why research to better understand them is absolutely vital. 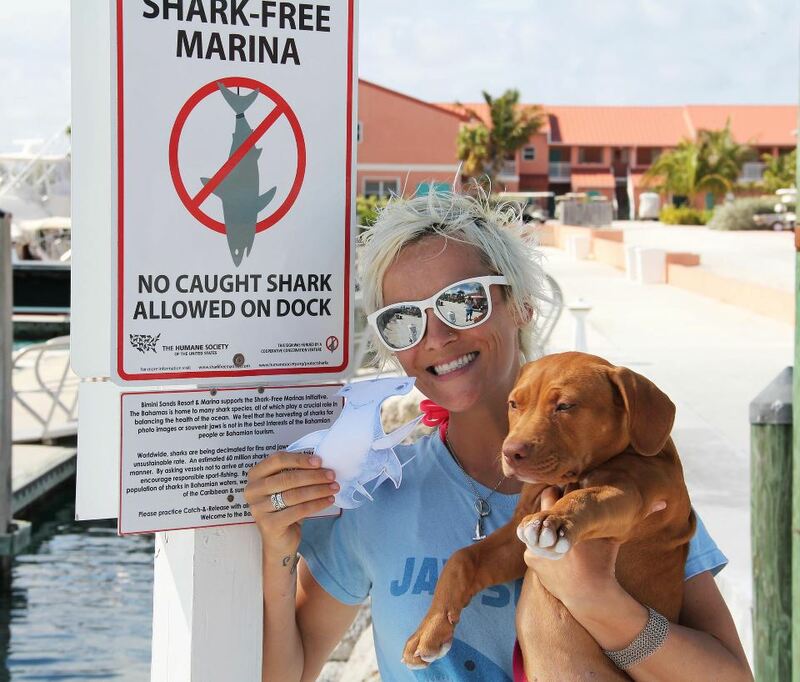 For over twenty years the Sharklab has been documenting the occurrence of these sharks around the islands of Bimini and in 2003 they began tagging and collecting genetic samples. The data is deficient on this endangered species and Bimini provides an ideal location for collecting this critical data. Science catalyzes the establishment of regulations to protect animals as well as being the backbone for conservation efforts. The work the Sharklab has done with lemon sharks was integral in getting them protected in Florida waters and will hopefully continue to do the same for other species on a local and global scale. Early in March, great hammerheads passed the initial stage of approval at the Convention on the International Trade in Endangered Species of Wild Fauna and Flaura, also known as CITES, in the early morning hours after I surfaced from an amazing dive with three of these incredible creatures. Diving with them is a remarkable experience, but seeing the Sharklab’s tags on them and knowing they might have a better future, solidified this as a dive I will never forget. I have had the great fortune of spending a lot of time in the water watching and getting to know these animals, so the approval of a CITES Appendix II listing was really the icing on the cake of an epic season here in Bimini.